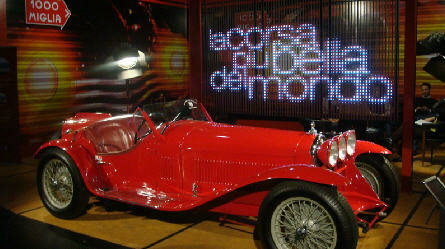 The 2012 Mille Miglia will take place from Wednesday, May the 16th (optional), to Sunday, May the 20th. Entry applications are now open and will close at 12 midnight on Sunday, December 18th, 2011. 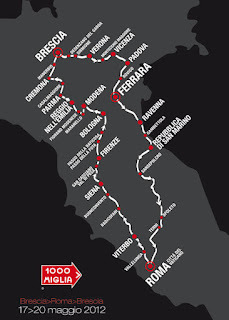 The route goes clockwise from Brescia to Rome and back, on the fabled Mille Miglia roads crossing seven regions: Lombardy, Veneto, Emilia Romagna, the Marches, Umbria and Lazio on the way down, adding Tuscany on the way back. The 2012 route will pass through some of the most beautiful cities of Italy. 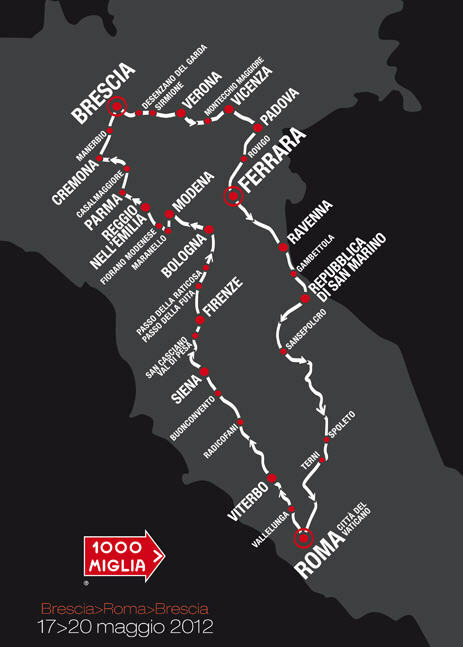 Along with Brescia and Rome, the Mille Miglia will be going through Verona, Vicenza, Padova, Ferrara, Gambettola, Sansepolcro, Spoleto, on the way, and Viterbo, Siena, Firenze, Bologna, Reggio Emilia and Cremona on the way back. New time trials will be scheduled for Umbria on the way, and also in Tuscany on the way back. Each road has its history, its anecdotes, its traditions. The eighty some years since the first Mille Miglia have seen changes along the roadside, as has Italy, but something unchangeable and unchanging remains: the passion inspired by the Freccia Rossa, symbol of the Mille Miglia. ItaliAgenda: Van alles voor de liefhebber van de Italiaanse kunst en cultuur in Nederland en Italië. Haar liefde voor Italië heeft Catharina Ravelli door haar roots: haar bet-overgrootvader kwam uit de Piemonte. Ze schrijft over de Italiaanse cultuur in ruimste zin van het woord op haar website www.italiagenda.nl : van spannende boeken tot goeie concerten, van mooie tentoonstellingen tot leuke cursussen, van nieuwe films tot bijzondere vakantieplekken en nog veel meer. Heel origineel zijn haar verhalen over Italiaanse beroepen zoals bijvoorbeeld de terrazzowerker. Aanrader dus, deze site !